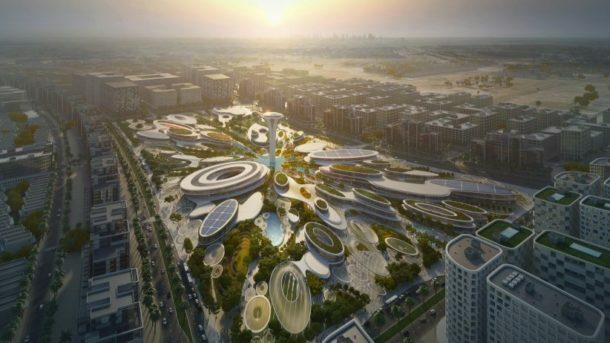 Zaha Hadid Architects has revealed plans for a vast cultural hub at the heart of a new masterplan in the United Arab Emirates city of Sharjah, which will comprise a series of droplet-shaped buildings set around a tapered observation tower. The project known as the Central Hub will cover a 17.5-hectare site at the centre of the new mixed-use development called Aljada. Developed by UAE-based Arada, the urban plan will provide homes for 70,000 residents and offer 500,000 square metres of office space along a 165,000-square-metre shopping district. These facilities will be arranged around Zaha Hadid Architects’ cultural centre, which will have a observation tower at its centre. Based on “the moment a water droplet strikes the earth’s surface”, the proposal will see multiple elliptical buildings radiate out from the tower, which narrows like a drip of water as it meets the ground. The design is symbolic of the project’s sustainable credentials, which will include water features irrigated by treated wastewater and canopies creating an habitable microclimate for gardens of native plants. The architects designed the oval-shaped structures to direct winds into the development’s civic spaces throughout the summer months, minimising the need for artificial cooling systems.